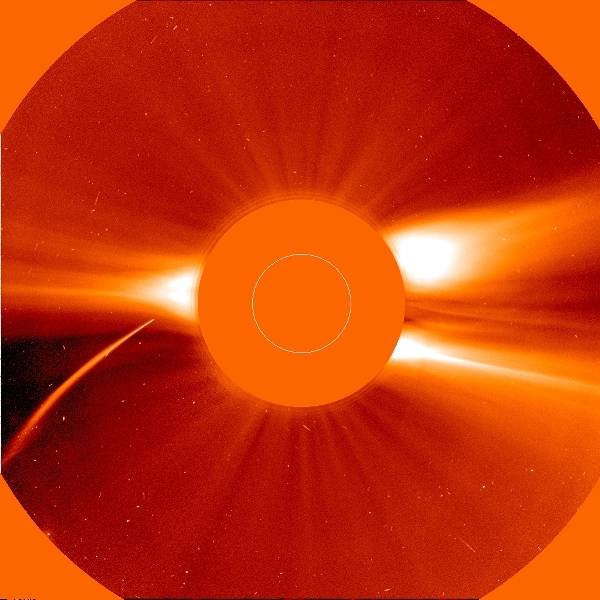 The LASCO C2 frame was selected to show Comet SOHO-6, one of numerous sungrazing comets discovered by LASCO, as its head enters the equatorial solar wind region. It eventually plunged into the Sun. This image of the solar corona on 23 December 1996 also shows the inner streamer belt along the Sun's equator, where the low latitude solar wind originates and is accelerated. Over the polar regions, one sees the polar plumes all the way out to the edge of the field of view. The field of view of this coronagraph encompasses 8.4 million kilometers (5.25 million miles) of the inner heliosphere.